Throughout October, we launched a series of podcasts to highlight the importance of building our nation on the truth of God’s Word. We looked at what it takes to build through a clear mission, clear vision, and a conviction that our current position is not where we need to be. We also discussed how to build amid opposition, which many in our ministry are already facing as they lead studies across Canada. 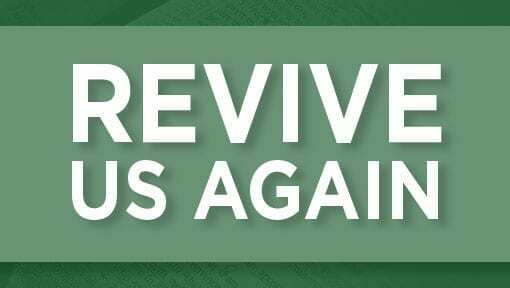 The final podcast in early November asked the question, “What does real revival look like?” Revival is defined as “bringing back to life or strengthening what is weak.” Is it your heart’s desire to see revival in Canada? Would you like to see thousands of people restored to the plumbline of God’s Word? This is my daily prayer as I travel across our amazing country. One of the best quotes I’ve ever heard on prayer is this: “Prayer moves that hand that moves the world.” Do you agree? Everything we do has to start with plugging in to our power source. When we pray, we’re asking God to move. This is the same God who spoke creation into existence, and the same God who said to Sarah, “Nothing is impossible for God.” Prayer is more than a simple conversation with God. This was Isaiah’s prayer: “rend the heavens and come down, that the mountains might quake at your presence” (Isaiah 64:1). Join me in praying for great revival in our nation, and that God would use Precept to engage thousands of people in relationship through God’s Word. Paul writes, “for our gospel did not come to you in word only, but also in power and in the Holy Spirit and with full conviction” (1 Thessalonians 1:5). Paul also writes, “For I am not ashamed of the gospel, for it is the power of God for salvation to everyone who believes, to the Jew first and also to the Greek” (Romans 1:16). For real revival to occur in our country, we must share the full truth of God’s Word. Jesus said, “I am the way, and the truth and the life, no one comes to the Father but through Me” (John 14:6). Jesus commanded us to make disciples, and this starts with the truth. We’re sinners destined for God’s wrath, but by the grace of God we’re saved through the blood of Jesus. There’s no way anyone can stand before God in confidence without being washed by the blood of Christ. Real revival will occur when the gospel is preached, and people are broken in their sin. Paul told the Thessalonian church that the gospel came with full conviction. People were broken in their sin, realizing they missed the mark. Paul writes, “For they themselves report about us what kind of a reception we had with you, and how you turned from idols to serve a living and true God” (1 Thessalonians 1:9). This is the problem in our country: we have too many people pursuing their idols instead of the living and true God. We need to ask God to bring this conviction and repentance. “Repent and return, so that your sins may be wiped away, in order that times of refreshing may come from the presence of the Lord” (Acts 3:19). Jesus tells the disciples to make disciples (Matthew 28:18–20). The process of making disciples is not a complicated one. We share the truth of the gospel, the Holy Spirit brings conviction, the person convicted repents of their sin, and they’re baptized to loudly proclaim the inward change. And then our work begins. It’s our job as believers in Jesus Christ to teach others how to live a life that brings glory and honour to the Lord. Paul writes in 1 Thessalonians 1:6, “You also became imitators of us and of the Lord, having received the word in much tribulation with the joy of the Holy Spirit.” How did these people whose great desire was to worship their man-made idols become living examples of Jesus Christ? Did it happen overnight? I believe that Paul molded and shaped the Thessalonians through the Word of God to become exemplary followers of Jesus Christ. These people were so passionate about Jesus, that Paul said they were doing so well in their walk, that he had nothing to say to them (vs. 8). For someone to imitate your actions, you have to spend time with them and be that example. For these believers to become imitators of Jesus, they had to be immersed in Jesus’ teachings, which we have in the Word of God. We must do more than “convert”; we must disciple if we want to see real revival in our country. We read about the Thessalonians, “you became an example to all believers in Macedonia and in Achaia. For the word of the Lord sounded forth from you not only in Macedonia and Achaia, but also in every place your faith toward God has gone forth, so that we have no need to say anything” (1 Thessalonians 1:7–8). Can you picture it? Idol-worshipping children of wrath turned by the living and true God to become a catalyst of the furtherance of the Kingdom of God and the building of His church. Precept is very passionate about seeing real revival in Canada. You can partner with us as we go out into the country and engage people in relationship with God’s Word. Thousands of people each year are being introduced to our life-changing method of Bible study. Partner with us as we strive to see revival in this country. Join us as a monthly financial and prayer support partner through our E-Team. Your financial gifts are used to train leaders, start new classes, and transform lives by the power of the Holy Spirit. To learn more about how God is using Precept Ministries, visit our website: www.preceptministries.ca/answer/testimonies/.